Well done Dan Greenaway of Windsor. 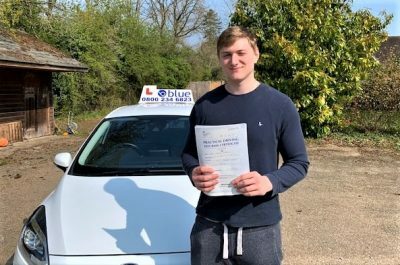 Dan passed his test in Chertsey this morning with just 1 driving fault. 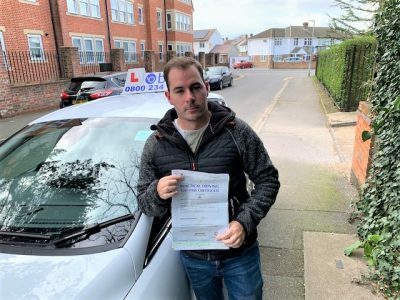 The test included a ‘Pull up on the right and straight line reverse’ and an emergency stop and the independent driving was following Satnav instruction. 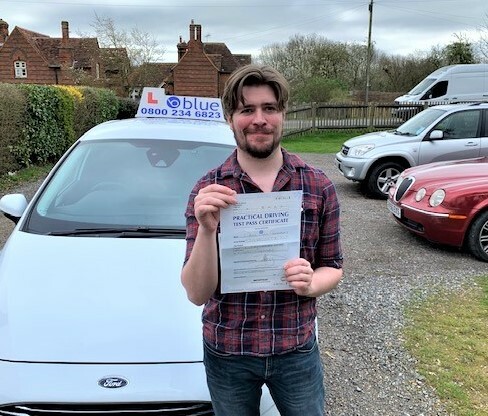 All the very best from Andy Shrimpton your driving instructor and all the team at Blue Driving school. 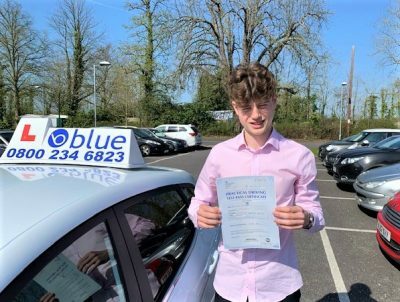 Driving for the first few times can be a harrowing experience for many, whether they are teens who just received their learner’s permit or adults who have not driven before. While the general instruction and tests provide a good background knowledge of what to expect, there is nothing like getting behind the wheel and driving into traffic. That’s why when you learn to drive in Windsor, it pays to have professional driving instruction to augment the lessons you have already learned in school and from your friends and family. The instruction provided is more than just advice, it offers an opportunity to start your driving in the right way. What is Professional Driving Instruction? 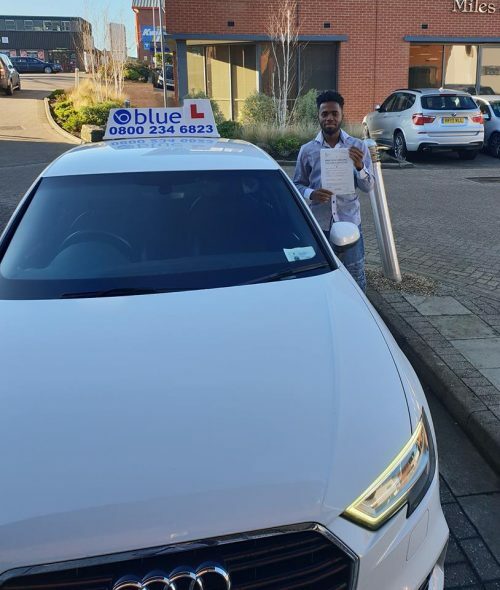 A professional instructor is a person who has amassed a considerable knowledge about the driving experience that starts when you get behind the wheel of your vehicle, takes you through the entire drive, and lets you know what to do when getting out of your car or truck. However, it’s more than just having an experienced person with you while driving as they can provide considerably more. All the lessons taught by the driving instructor come together to help you become a better driver. This is why those who learn from professionals have a better, overall safety record which means fewer accidents and tickets. 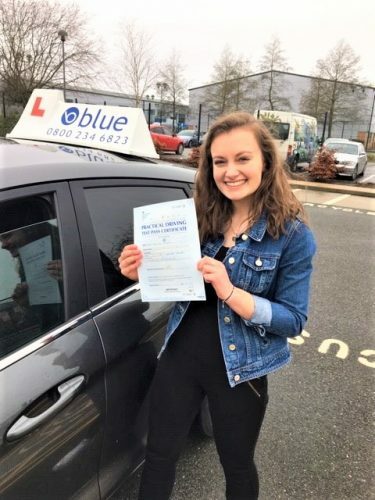 Your first lesson takes place behind the wheel with the instructor present to guide you through the various situations that occur when in traffic. Practical instruction delivered in a way that helps guide you through the driving experience. As you gain in experience, the lessons become more advanced so that you fully understand traffic laws, signs, and what to do under various driving conditions. You will experience driving in street to street traffic, on highways, and in neighbourhoods so you can gain the right knowledge of obeying street signs and understanding how to react in different situations. Knowing what to do makes all the difference when driving on the road. 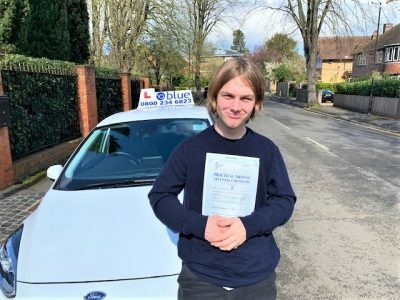 For anyone who wants to start their driving the right way or learn valuable lessons to build upon their driving experience, then a professional instructor is what you need. Considering the cost of their services, what you learn from them may be the most valuable lessons you ever receive. The ability to know what to do in different traffic situations will help keep you safe and minimize the potential for causing accidents. When you learn to drive in Windsor, you will be learning skills that will stay with you for the rest of your driving days. That means the more you know at the start, the better off you will be when driving around Windsor or any other location. A professional instructor provides more than just knowledge, they can help you better associate the information you have learned and apply it to your driving.